X-Mas Dinner Buffet is an event that took place between 22-Dec-2006 and 28-Dec-2006 in Hyderabad. There's no proof that God intended for man to save money during Christmas. Helping you take full advantage of that loophole is Green Park. With Christmas season in, Hotel Green Park is hosting the longest Christmas dinner buffet in town, from 22nd to 28th December, at its multi-cuisine restaurant, Once Upon A Time. The spread comprises some traditional Christmas dishes like the Roast Turkey, Southern Fried Fish, Murrel Lombardio, Cold Meat Platter, Mexican Counters, Tausi Potato, Plum Cake with rum sauce, Christmas Pudding, Yule Log, Baba Aurum and Mince Pie - all for Rs. 325 + taxes as applicable. To give you a feeling of the festive spirit, the restaurant has been decorated with a Christmas tree, balloons and stars, with carols and music in the background. Of course, Santa will be there, distributing sweets for children. The buffet is on for dinner only. For further details, please contact the restaurant at 2375-7575/6651-5151. 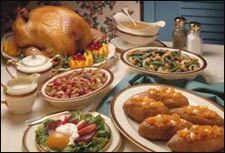 Be the first to comment on X-Mas Dinner Buffet! Just use the simple form below. fullhyd.com has 700,000+ monthly visits. Tell Hyderabad what you feel about X-Mas Dinner Buffet! Workshop On Annamacharya Keerthanas For Students.